The other day, I found an article citing Apple's advantage had more to do with manufacturing than design. Today I had an experience that tends to reinforce the opposite view. After a laptop upgrade, I had to spend upwards of 40 minutes looking for the setting to prevent windows from maximizing all by themselves. Update: In Win 8 the settings are in the same obfuscated place! Ouch! I was in no hurry to start tweaking things but every time a window got anywhere near the top of the display, it maximized. I went googling for this as I'd solved it almost a year ago when I first got Win 7. Sure enough it was an easy fix in Control Panel. Or was it? One site sent me to appearance settings. Another sent me to security settings. It turns out that both of these were wrong and the setting I was looking for was in MOUSE settings. I switched it off and I lost the ability to "shake" the active window to hide other windows. What a joke. I could have searched in Control Panel or the Start Button for this but I would have to recognize "window arrangement" as the setting I was looking for when searching for maximize. This whole OS feels like it's cobbled together by an outfit that's overworked and understaffed. 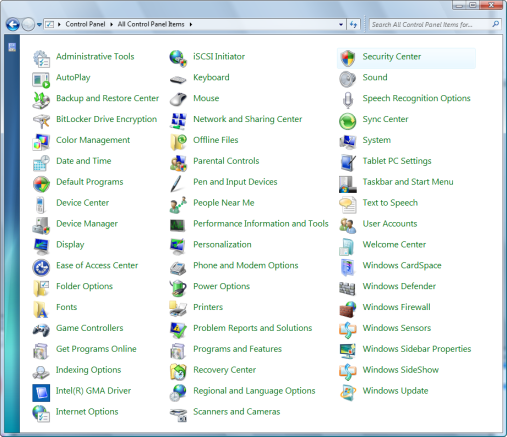 Just look at the category view of Control Panel and it looks like random categories defined by a guy who has no idea how to categorize things. Don't switch to icon view if you don't have your reading glasses as there are nearly 60 of them! 60 icons in a top level menu? This is usable? I don't understand those Windows zealots who claim OS X and Win 7 are somehow "equal". They are not. Windows 7 is somewhat stable but it is a user interface mess that I prefer not to deal with. Now I have to go off and use regedit to fix something that is a checkbox in OS X: the handling of capslock. Oh, and I get to do a reboot just to get the setting to take effect. Update: The other night, I was one of the 500,000 who grabbed the Win 8 preview. I wanted to see how it worked. Of course I also wanted to poke around in the new Control Panel for the aero setting. Sadly it's in the same place. I haven't had a chance to see if it's an "all or nothing" proposition just yet. I like the way Metro works but there's no way to quit an app. You have to get to the desktop and alt-f4 out of all of them and then alt-f4 to quit the OS. Clunky. As upset as I am about the scattered and spattered way Windows does settings, I see a glimmer of hope with Windows 8. Quite a few settings had been "promoted" out of the tangled mess Control Panel to it's Metro wrapper. If MS ever gets around to pushing this user interface deeper into the entire OS, it could be very nice. If they leave it like it is, a wrapper on top of Windows, I'll be disappointed. As much as I like Apple gear, I also like competition and while Win 7 looks nice, win 8 holds a promise for genuine competition.